Cast: Cillian Murphy, Liam Neeson, Ruth Negga, Brendan Gleeson, Bryan Ferry, Stephen Rea. Directed by Neil Jordan, adapted from the book by Pat McCabe. Story: An adopted cross-dressing Irishman grows up looking for his mother. Breakfast on Pluto suffers from its subject matter. A bloke in a dress and high heels is not going to appeal to the masses, so such a movie needs to be brilliant to overcome its handicaps. And it isn't. Give it its dues, it has some novel ideas. The subtitled conversations between two CGI robins are quite fun, and indicative of the cheeky style, but the main thread is young transvestite Cillian Murphy as he struggles to deal with life in a sleepy Irish town. His adoptive mother is less than a rock of support, but that doesn't stop him from dressing up in her clothes. Priest and adoptive father Liam Neeson lends weight to the family and is the best ingredient in a variable movie. Cillian Murphy, who you'll recognise from Batman Begins, Red Eye and 28 Days Later, becomes more convincing as a woman as the movie progresses, but his high voice is very weak and his accent strong, which makes much of the dialogue very difficult to hear - the scene in the confessional is almost entirely unintelligible. Fortunately though, the story itself is interesting and fast-moving enough to make up for it, containing as it does several surprising and moving events, none of which can be seen coming. And of course it's all infused with the freshness and subversiveness so common with Irish movies. Breakfast on Pluto tries hard and is entertaining, but there's no denying that any straight man is going to find it uncomfortable to watch. Recommended for a rental if you can watch Pete Burns on Celebrity Big Brother without cringing. Testosterone Satisfaction Rating: -1/5 - pervasive swearing and some Irish terrorism. To enjoy this film you should be: comfortable with cross-dressing. 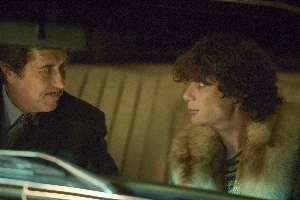 Breakfast on Pluto is released in the UK on 13th January.